If you do not find the answer to your question below please contact us. Yes, reservations are required for most of the tours. Our City Tours start at 10:00, 11:30 and 14:30, 15:30 and don't require an advance reservation. Though from May till Sept to guarantee a spot it is recommended to book at least 12 hours in advance. Our Praha Bike City tours are from 2 to 7 hours long. Our private tours can be adjusted according to your request. Our Country tours are around 8 hours long (including bike riding time, lunch, return time by train or minivan) and also adjustable on your request for Private tours. On tour, do we stop and receive info? Yes, we stop multiple times on our Praha Bike City Tours so that you are enriched with cultural, historical and architectural information about the specific stop and Prague in general. You will also have lots of photo opportunities. It is a bike tour and not a walking tour and we are rather seeing more than talking :). On our 2.5hour bike tour we spend about half of the time biking and another half talking. Our guides provide information in an entertaining, interesting (sometimes funny) manner, using Prague's history and architecture as a lens of the city and country's spanning history. Is there water, beer, lunch or bathroom break on the tours? We have a bathroom for our customers at Praha Bike and there is water for sale. At the midpoint of the tour, there is also a bathroom break. We don't recommend drinking alcoholic beverages and riding, there is always time for a beer after the tour. We do not stop for lunch on our City bike tours as 2-3 hours is just enough time to cover important & interesting stops. We do stop for lunch on our Big All-in-one, Karlstejn or Konopiste Castle tours. Is the tour cancelled in case of the rain? Our tours run in the rain as well. We have ponchos available for everybody before the tour. In the case of the big rainstorm, we can cancel the tour and refund the money or change the start time/date. Those situations happen very rarely. Do we need to take money with us on the tour? There are not too many opportunities to spend money on city bike tours, although on the longer private and country tours, taking money is necessary for lunch, snacks or replenishing drinks. All Praha Bike City Tours are for all level of riders from beginner and advanced, and for children as well. Private tours can be adjusted for higher or lower difficulty level riders, for distance and duration. 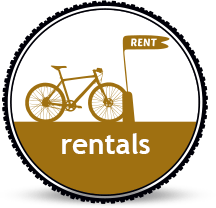 Are helmets and locks included in the rental? Locks and helmets are free of charge with any bike rental. You may also rent repair-kits, rear saddlebags, front handlebar bag and other biking accessories. What is the make-up of your groups? I'm not a fast rider. Can I still join the tour? How fast do you ride? We are not racing and tours go in a very easy pace. Praha Bike promotes a "stop and smells the roses" philosophy of bike touring. We believe that to truly enjoy your cycling experience, you need to set a slower pace, take time for sightseeing and have a fun experience! As for tours outside of Prague, like ONE DAY BIKE TOUR TO KARLSTEJN CASTLE, guests must be able to ride a bike and be fit to cycle 35km/22miles as an alternative you can reserve an e-bike in order to keep the pace about 14km(9miles)/per hour. Do I have to use sunscreen? it’s your call. Each person’s needs vary so much with season, latitude, skin color, personal history, philosophy, and so much else that it’s impossible to provide a one-size-fits-all recommendation. This article may help you with a decision: Is sunscreen the new margarine? What kind of bicycles do you use for tours? We have plenty of different bikes at Praha Bike, ready to fit the needs of everyone. Usually, for our City Tours we provide City-Mountain type Bikes. They are equipped with 7 gears, 26” all terrains tires and front fork with shock absorber, particularly made and adapted for Prague. For countryside tours we use Trekking/Hybrid bikes with 28” wheels, 7/27 gears and thinner tires for smooth longer rides. All our bikes are available in different frames & sizes in order to fit different heights. It is always possible to upgrade to Trekking or Electric bikes. We are proud to say that a substantial part of our time and finances are dedicated to repairing and reusing our bike frames and parts in order to help to reduce consumption and saving natural resources! Are there any restrictions when biking in the city? Bicyclists must follow the same basic traffic rules as cars. Bike paths should be used when provided, otherwise, you must bike on the road in the absence of bike paths. You must respect pedestrians and stop for pedestrians in crosswalks. Is it possible to do the tour with an Electric Bike? Yes, you can always decide to book any tour with an E-Bike or upgrade your standard bike to an electric one just before the tour (subject to availability, additional fee apply). We also have tour exclusively on E-Bikes “Great Prague - E-Bike City & Park Tour”. Use of regular & electric bikes is allowed for the same tour. The tour goes at an easy and not a fast pace and using an e-bike will not make you go faster but makes the trip easier. Are guided tours suitable for kids/families? We do provide solutions for younger ones: extra child seat on their parents' bikes, tag-along and even a tandem with a rear seat for a small child. We also offer kids bikes in several sizes for children to able to ride safely and autonomously. Helmets are mandatory and of course included. We recommend to contact us in advance in order to accomodate your needs. Are there audio guides available in languages other than English? We use audio transmitters and you will be hearing your tour guide in real time. All daily group tours are led in English. Other languages are available upon special request and may affect the tour cost. Are there any discounts for loyal customers? Yes, indeed. After any tour you get a 50% off on any bicycle rental for the same day. And the following days, you still get a 10% discount. Is there a weight restriction when riding a bike? Unfortunately, yes. We have a participant weight limitation: under 125 Kg (270 lbs). More than that can be dangerous for the person and for our bikes. We are sorry for any inconvenience this may cause, it is a factory safety warnings. Is Prague a bike-friendly city? Well, is not Amsterdam, yet, but things are improving a lot in the last years. Czechs love to ride a bike and the government is taking note, creating more and more bike paths, and making this wonderful city a bike-friendly city. If you are not a confident rider or afraid to ride in the city, there are nice bike paths along the river, in the parks and out of Prague. We can help you with recommendations, maps and directions on how to get out of the centre easily. I’m a solo traveller. Can I still join a tour? Of course, no problem at all. Even better, that way you will make friends in Prague. Some tours have a minimum number requirement, but in a high season, most of the tours run usually at full capacity. Can I join the tours outside of Prague (to Karlstejn, Troja, Konopiste, Pruhonice ... castles) without reservation? For tours outside of Prague, like the Karlstejn bicycle tour, we do need reservations in advance. You can make a reservation as late as 1 hour before the start and if the tour is available and has enough free spaces you can join it at the last moment. Is it safe to park the bike outside? It is safe to park the bike outside during the day. With all our rentals we give free strong locks. You need to always lock your bike using common sense (do not block any doors, entrances, ways). But if you want to take the bike overnight, we do not recommend to lock the bike outside, you need to park the bikes indoor or in a safe place to prevent any theft attempts. What does PrahaBike Bicycle Insurance include? - Theft (Theft must be reported to police. Only apply if the bicycle was properly locked and stored indoor overnight. Insurance contribution 40€. Theft Bicycle Insurance valid in Czech Republic.